James Nelson spent 1996 at HQ Russian Brigade in Bosnia where he was the main American interpreter. This is his account of what he saw, heard, and experienced. 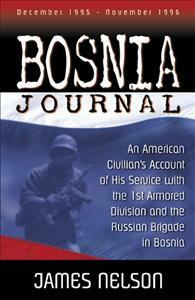 The 1st Armored Division formed the core of Multinational Division North to keep the peace in Bosnia in 1996. A Russian brigade was part of that effort. Jim Nelson was personal interpreter to Major General William L. Nash in his dealings with the Russian commander, and Jim was stationed at HQ Russian Brigade for that purpose. He also interpreted for many others, both civilian and military, developing close relationships with both Russian and American personnel. This is the first publication of the journal that he kept while there.